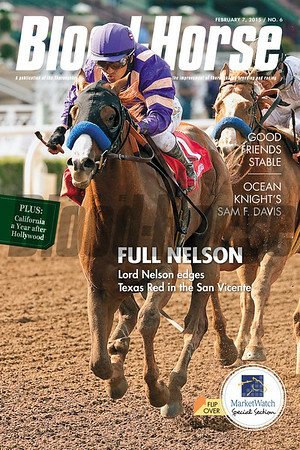 February 7, 2015 Issue 6 cover of the Blood-Horse featuring Lord Nelson winning the San Vicente at Santa Anita Park. 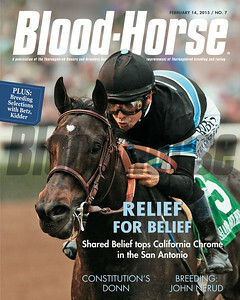 March 14, 2015 Issue 11 cover of Blood-Horse featuring Shared Belief winning the Santa Anita Handicap. 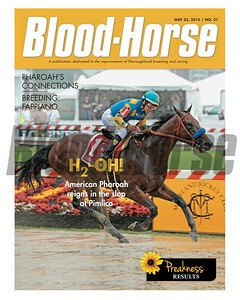 May 23, 2015 Issue 21 cover of Blood-Horse featuring American Pharoah and jockey Victor Espinoza winning the Preakness Stakes at Pimlico. 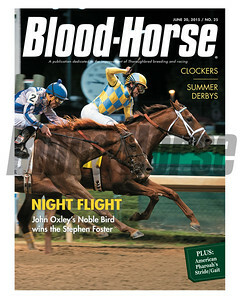 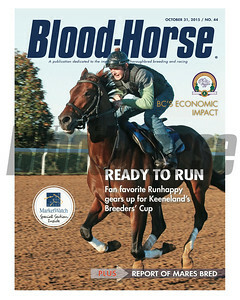 June 20, 2015 Issue 25 cover of the Blood-Horse featuring Noble Bird winning the Stepehen Foster Handicap at Churchill Downs. 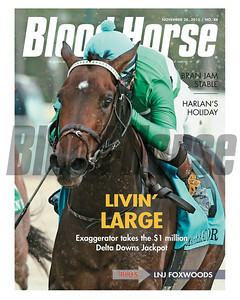 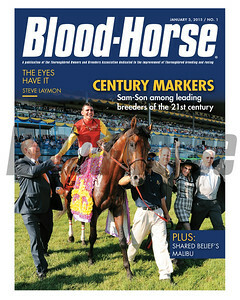 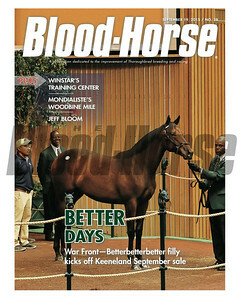 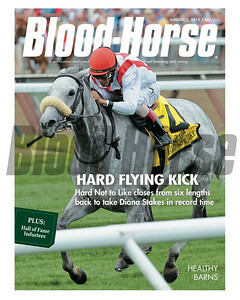 August 1, 2015 Issue 31 cover of Blood-Horse featuring Hard Not to Like winning the Diana Stakes at Saratoga. 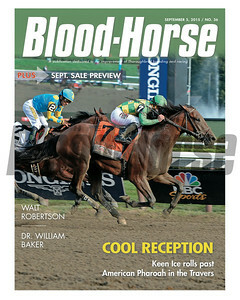 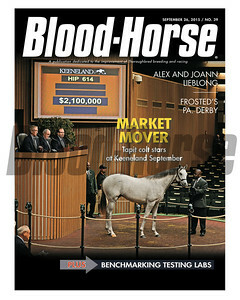 September 5, 2015 Issue 36 cover of Blood-Horse featuring Keen Ice defeating American Pharoah in the Travers Stakes at Saratoga. 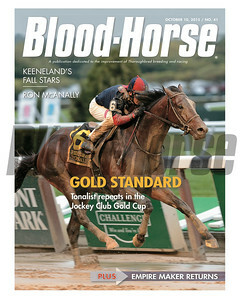 October 10, 2015 Issue 41 cover of the Blood-Horse featuring Tonalist winning the Jockey Club Gold Cup at Belmont Park. 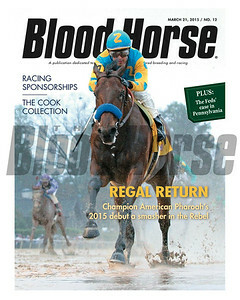 March 21, 2015 Issue 12 cover of the Blood-Horse featuring American Pharoah winning the Rebel Stakes at Oaklawn Park. 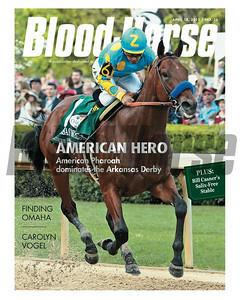 April 18, 2015 Issue 16 cover of the Blood-Horse featuring American Pharoah winning the Arkansas Derby at Oaklawn Park. 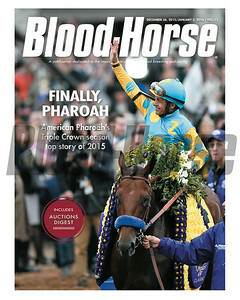 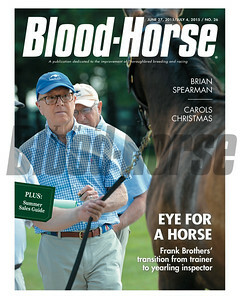 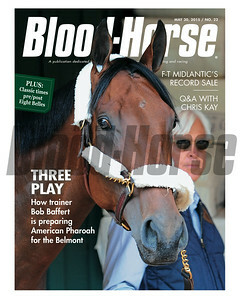 May 30, 2015 Issue cover of Blood-Horse featuring American Pharoah and Bob Baffert. 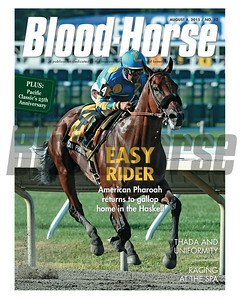 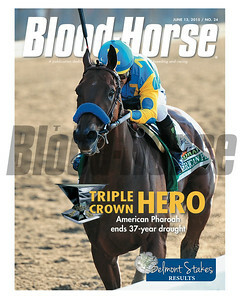 August 8, 2015 Issue 32 cover of the Blood-Horse featuring American Pharoah winning the Haskell Invitational. 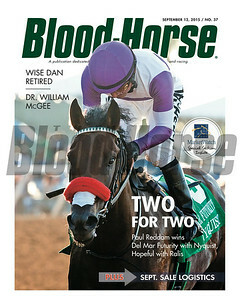 September 12, 2015 Issue 37 cover of Blood-Horse featuring Nyquist winning the Del Mar Futurity. 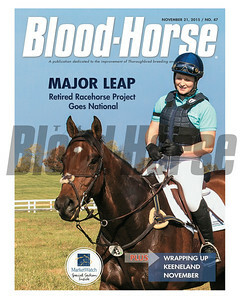 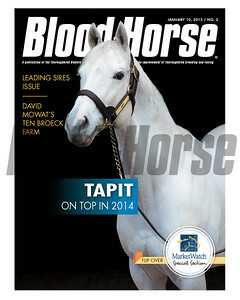 November 21, 2015 Issue 47 cover of the Blood-Horse featuring Dare Me & Rosie Napravnik at he Thoroughbred Makeover and National Symposium at the Kentucky Horse Park on October 23, 2015. 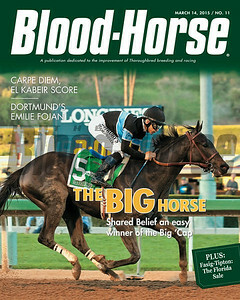 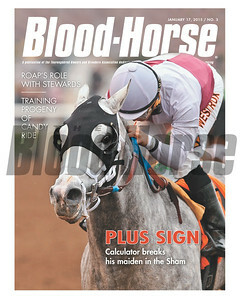 January 17, 2015 Issue 3 cover of the Blood-Horse featuring Caculator winning the Sham Stakes at Santa Anita Park. 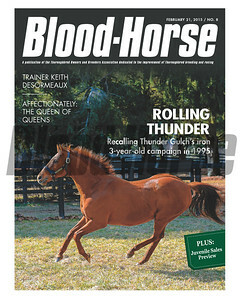 February 21, 2015 Issue 8 cover of the Blood-Horse featuring Thunder Gulch at Ashford Stud. 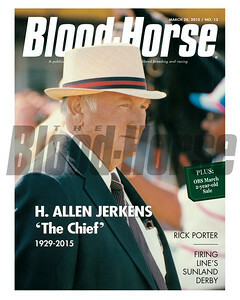 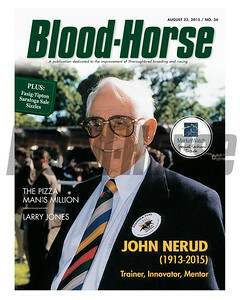 March 28, 2015 Issue 13 cover of the Blood-Horse featuring Allen Jerkens. 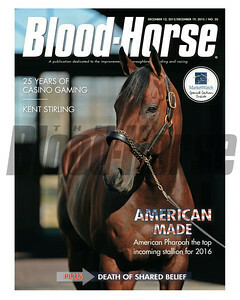 May 2, 2015 Issue 18 cover of Blood-Horse featuring American Pharoah preparing for the Kentucky Derby at Churchill Downs. 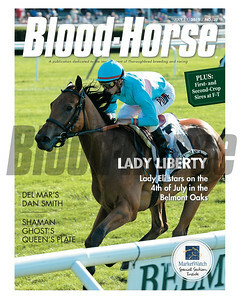 July 11, 2015 Issue 27 cover of Blood-Horse featuring Lady Eli winning the Belmont Oaks at Belmont Park. 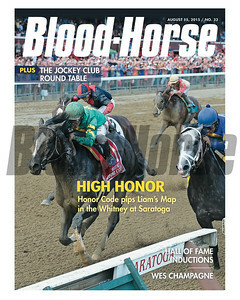 August 15, 2015 Issue 33 cover of the Blood-Horse featuring Honor Code winning the Whitney Stakes at Saratoga. 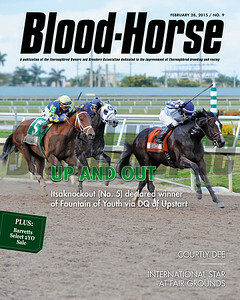 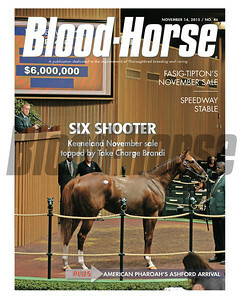 February 28, 2015 Issue 9 cover of the Blood-Horse featuring Itsaknockout #5 winning the Fountain of Youth Stakes at Gulfstream Park after Upstart was disqualified. 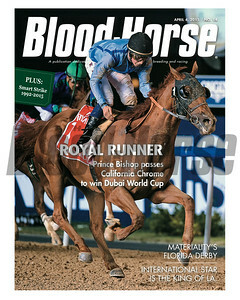 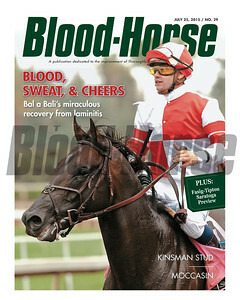 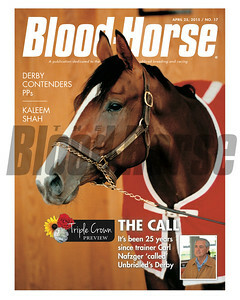 April 4, 2015 Issue 14 cover of the Blood-Horse featuring Prince Bishop winning the Dubai World Cup. 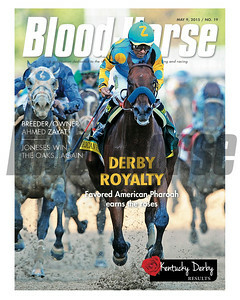 May 9, 2015 Issue 19 cover of the Blood-Horse featuring American Pharoah and jockey Victor Espinoza winning the 141st running of the Kentucky Derby at Churchill Downs. 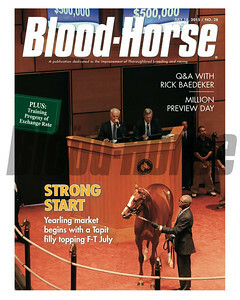 July 18, 2015 Issue 28 cover of the Blood-Horse featuring Hip 317 at the 2015 Fasig-Tipton July Sale. 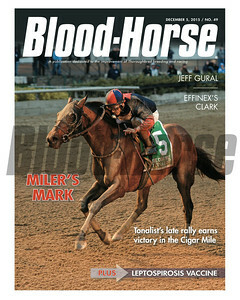 December 5, 2015 Issue 49 cover of Blood-Horse featuring Tonalist winning the Cigar Mile at Aqueduct. 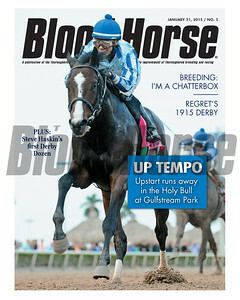 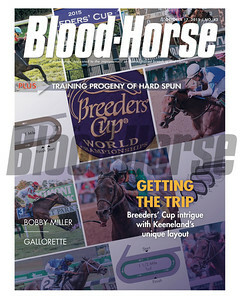 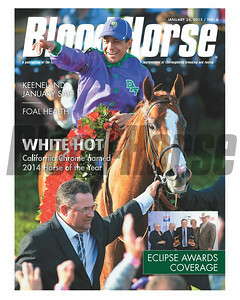 January 31, 2015 Issue 5 cover of the Blood-Horse featuring Upstart winning the Holy Bull at Gulfstream Park. 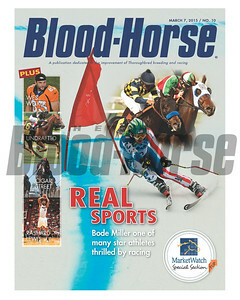 March 7, 2015 Issue 10 cover of the Blood-Horse featuring Bode Miller, Wes Welker Cigar Street and Rashard Lewis. 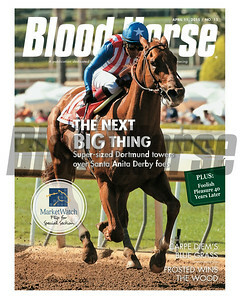 April 11, 2015 Issue 15 cover of the Blood-Horse featuring Dortmund winning the Santa Anita Derby. 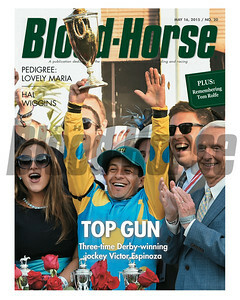 May 16, 2015 Issue 20 cover of the Blood-Horse featuring jockey Victor Espinoza after winning the 2015 Kentucky Derby at Churchill Downs aboard American Pharoah. 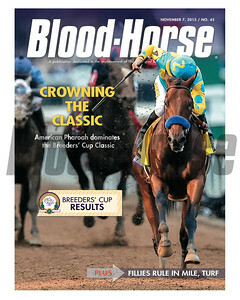 June 13, 2015 cover of the Blood-Horse featuring American Pharoah winning the Belmont Stakes. 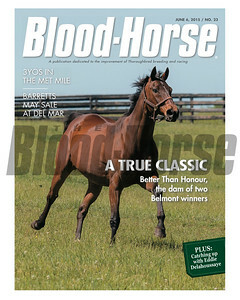 July 25, 2015 Issue 29 cover of the Blood-Horse featuring Bal a Bali. 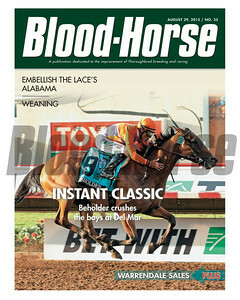 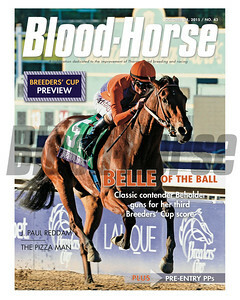 August 29, 2015 Issue 35 featuring Beholder winning the Pacific Classic Stakes at Del Mar. 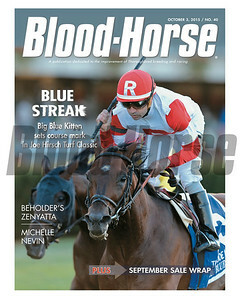 Ocotber 3, 2015 Issue 40 featuring Big Blue Kitten winning the Joe Hirsch Turf Classic Stakes (gr. 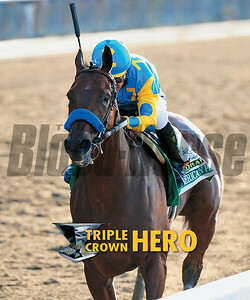 IT) at Belmont Park on September 26, 2015.